I went out into the frigid coldness, just to get out and do something, and wound up at an antique mall. Oops. 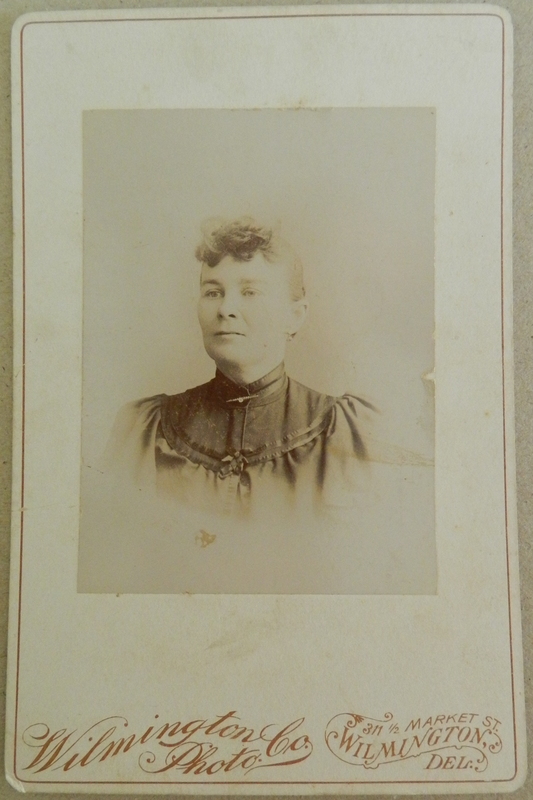 I came back with a stack of 1880s-1920s photographs for very little. Huzzah! So here they are. All except one are undated, with no notes at all. So have fun imagining who these people were. 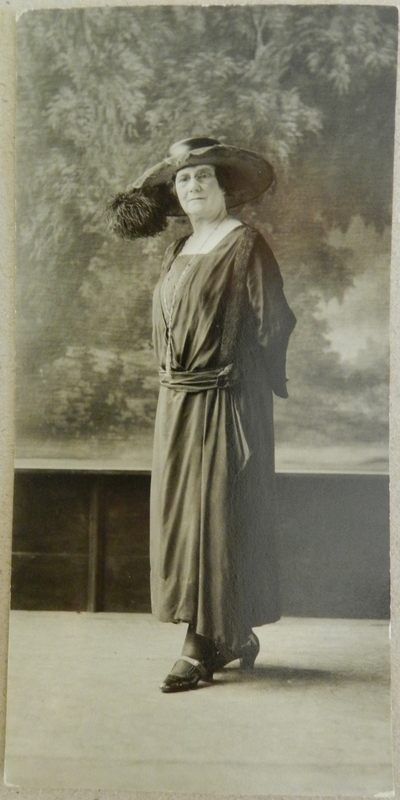 This woman is just so fabulous – the anti-flapper. I love her (tiny!) shoes, with the added, contrasting strap, and her long necklace, a nod to one fashion of the day, and a stereotype decades later. Her hat is just too cool, too – I think it’s got a wire frame, you can make it out under the brim. She’s here to tell us that not everybody was a skinny jitterbugging flapper, and that’s awesome. 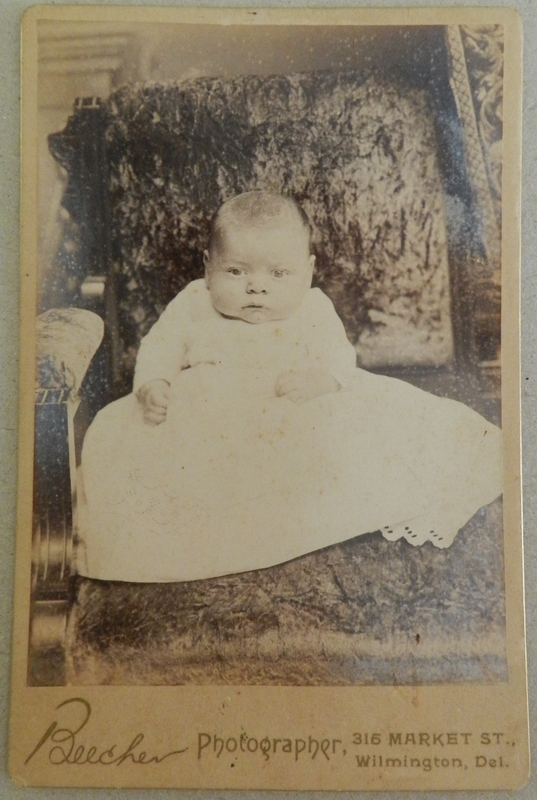 This photo is dated July 4, 1923 – if she is about 60 years old here, she was a baby during the Civil War. Think of the things she saw. I dare you to find a photo of stronger, more independent, capable looking women. 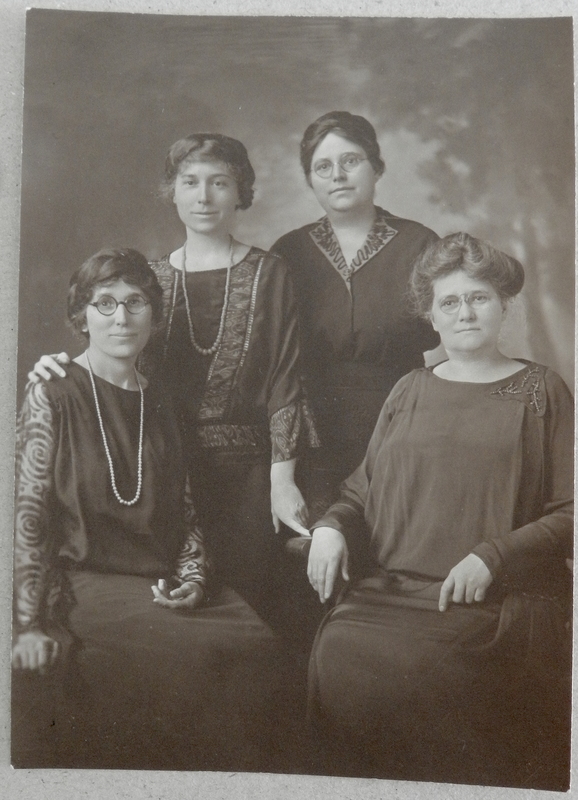 I love them – a range of ages, possibly all related, probably sometime between 1919 and 1923-ish. The two younger women have dresses to die for – look at the sitting woman’s sleeves. Ugh. Want. What I really like is the variation in fashion here. Take off those thick-rimmed glasses for the portrait? Nope. Crazy flapper eye makeup? Nope. Bobbed hair? Nah, I’m just going to wrap my 4 feet of Gibson Girl leftovers around my head in a braid (see the two younger women) – or just keep wearing my ca. 1905 poufy thing (the seated older woman). This undated photo is one of my favorites. I want to high-five them all. That mustache. Oh my gosh, that mustache. First came the ‘stache, then the ‘stache grew a man as a support system, so it could wear awesome ties and generally be the definition of ‘dapper’. 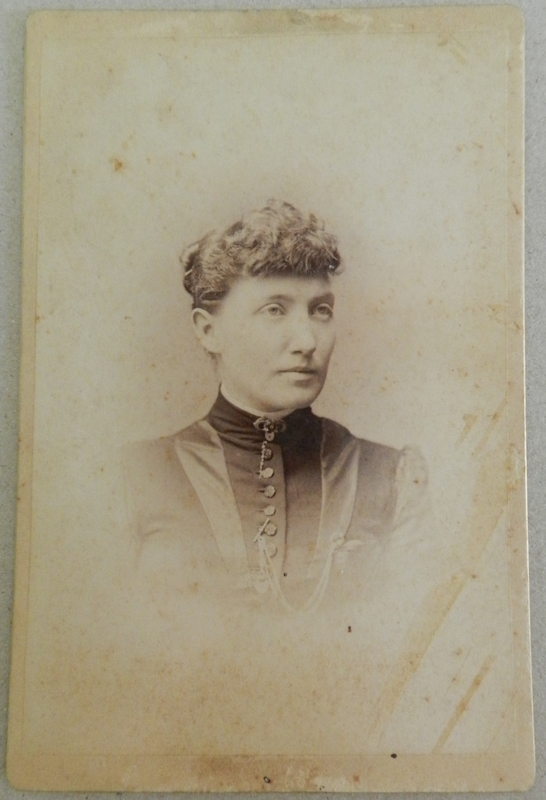 Undated, but taken in a photography studio in Wilmington, DE. This poor woman looks like she’s drowning in her own dress. Mid-1890s, taken in Wilmington, DE. He shot the sheriff, but he didn’t shoot the deputy … haha. If I had half a chance I’d wear that jacket of his. How cool is that contrasting binding? 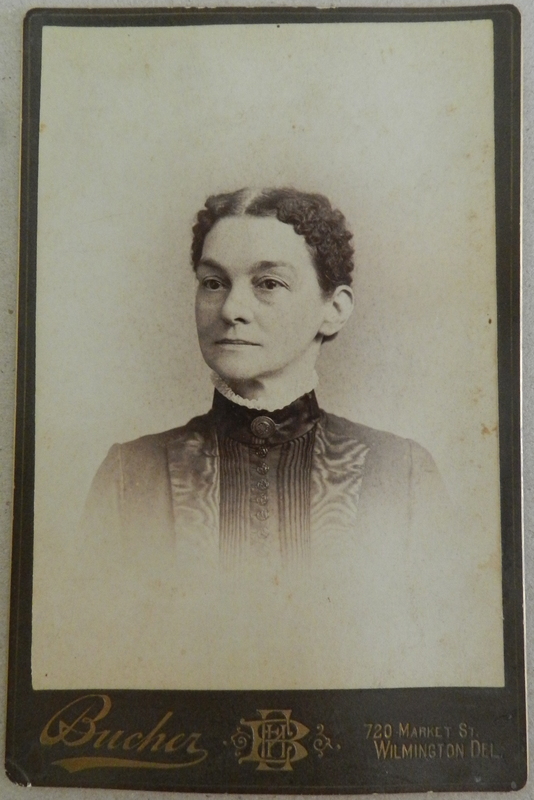 Undated, from Wilmington, DE. She’s so pretty. If you look closely, you can see she has a little tiny watch pocket on the front of her dress, and a little tiny watch in it. 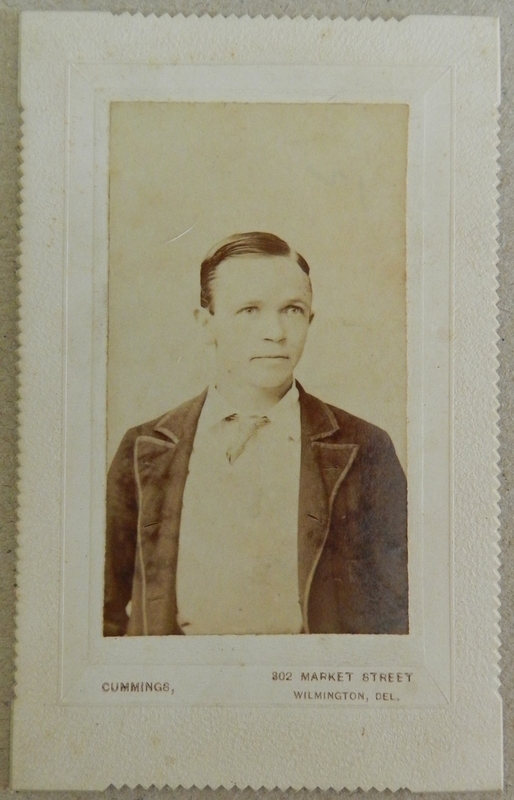 Probably early 1890s, from Wilmington, DE. 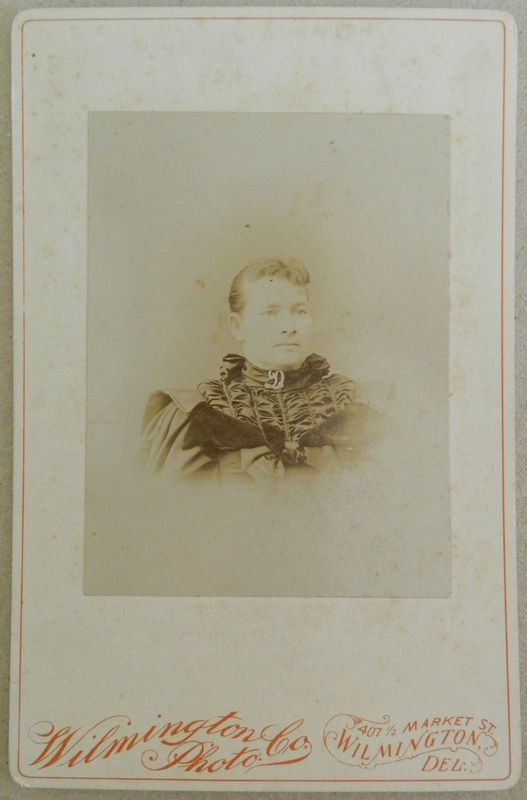 Probably from the 1890s – I think this might be a second photo of the poor woman who was being suffocated by her dress, above. Wilmington, DE. Wilmington, DE, probably 1880s-1900. This is one tough looking woman. Aww, a little baby, looking kind of lost propped up on that big chair. This photo’s also from Wilmington, DE, but as baby’s clothing isn’t easily date-able, I have no idea when it’s from. Sometime between the 1880s and 1910s, at the most. The net tea gown, finished! 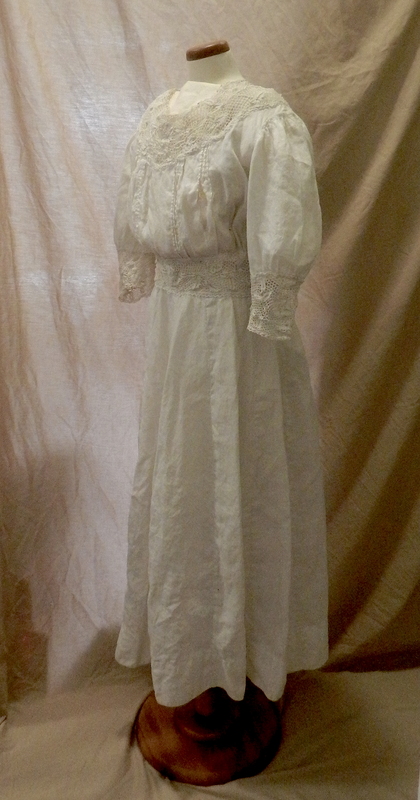 My net tea gown is all washed, dried and steamed out, so today I got her on my mannequin. Isn’t she pretty? 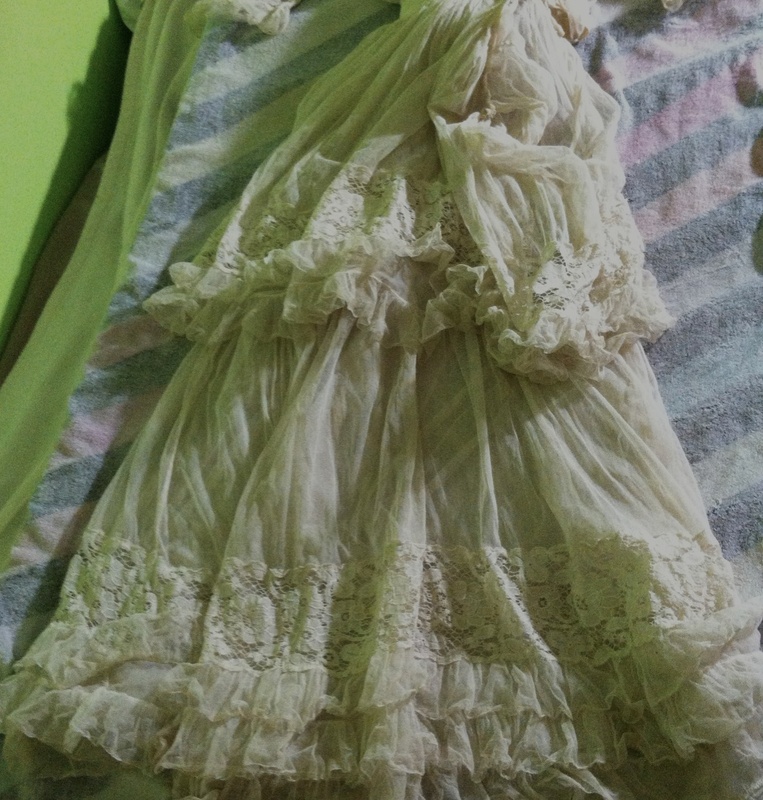 The lower skirt looks a lot whiter than the rest of the dress because you’re only seeing two layers of net there, and then the white petticoat I photographed it over. The rest of the dress looks yellow because you’re looking through four or more layers of net, and the white padding on the mannequin is harder to see. Im thinking of taking photos later with unbleached cotton under it, to get a more accurate color. The brighter white kind of distracts me. Disclaimer: The skirt has a weird hitch at the left hip because of an old repair gone wrong. It left a big pucker in the inner skirt and the hemline doesn’t fall straight now. 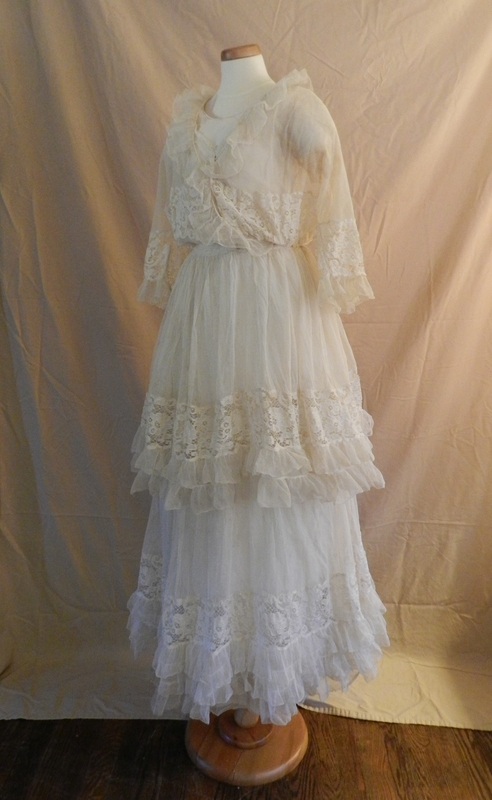 When I first saw this dress I thought it might be early, maybe 1905-1910, but I wasn’t totally comfortable with that date range – I couldn’t find a lot of similar dresses. It looks different on a mannequin. Now I think it’s probably 1914-1917. 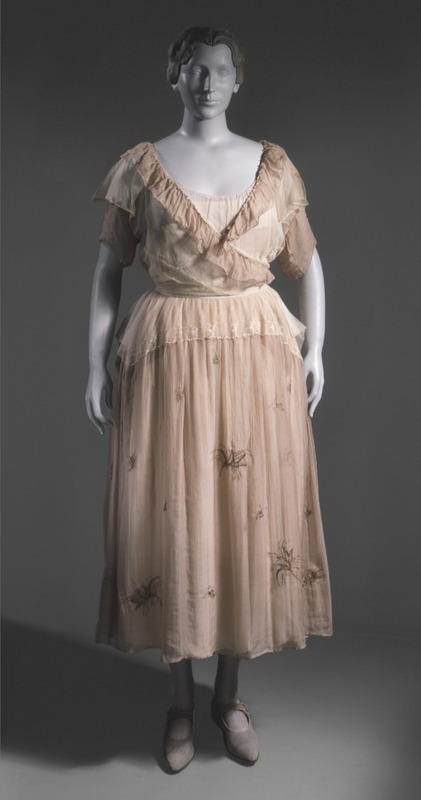 A 1917 silk chiffon and net Austrian tea gown from the Los Angeles County Museum of Art. Bingo! 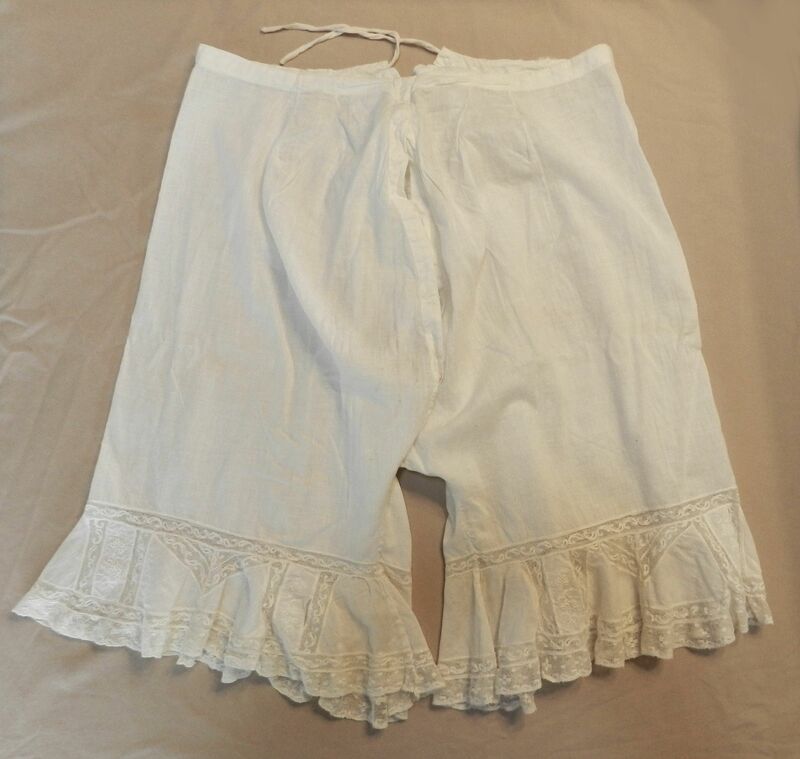 (Cotton) net, shorter skirt, layers, somewhat fitted sleeves, and that ruffly wrap front with the same attached under-shirt. I wish I had a parasol, white shoes and a nice hat to pair with it! It’s the perfect summer tea party dress! I don’t have those things (yet …), but I do have the coat that goes with it, and that pretty glass bead purse in my last blog post. I’ll reunite them, maybe later this week, and get some more pictures up. It’s been difficult to get good photos of my vintage stuff, but today, my camera liked the light, and detail came out! Yay! I wrote up four of my items on my other blog, The Everyday Clothing Project. Click on the links to go to that blog and see more pictures and stuff. The Everyday Clothing Project isn’t to sell items, but to document and, hopefully, to serve as a reference for users. Or to supply images for Pinterest. That would flatter my photography skillz. So here are the items. One: this homemade turn of the century linen and cotton corset cover, in a wearable size that’s just asking to be reproduced. 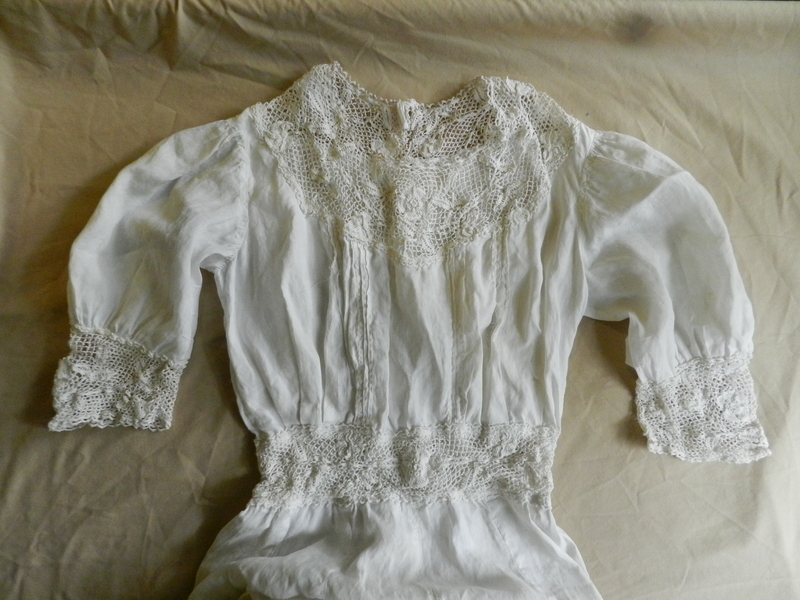 Check out that lace and linen vandyked bit around the neckline. 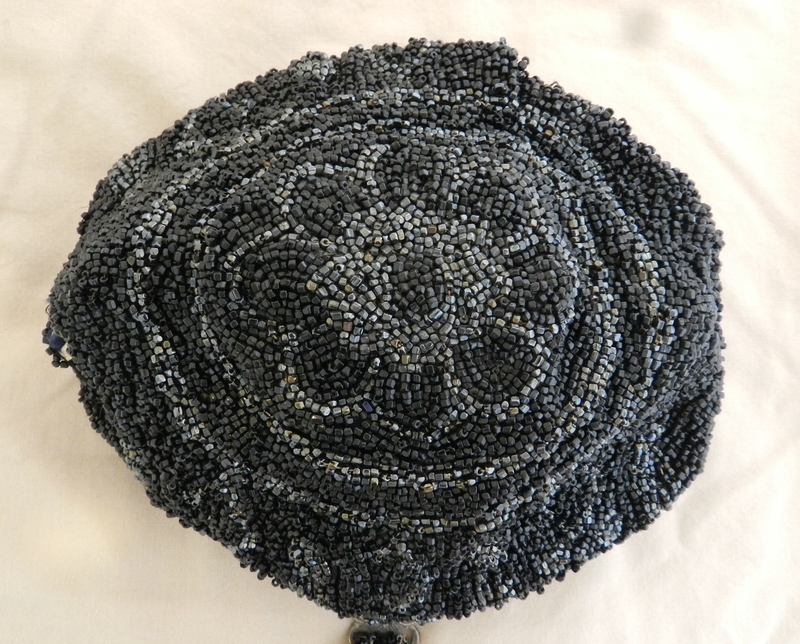 Two: This gorgeous turn of the century beaded purse, which I want to photograph with the silk jacket of awesome awesomeness and its associated net tea gown, eventually. 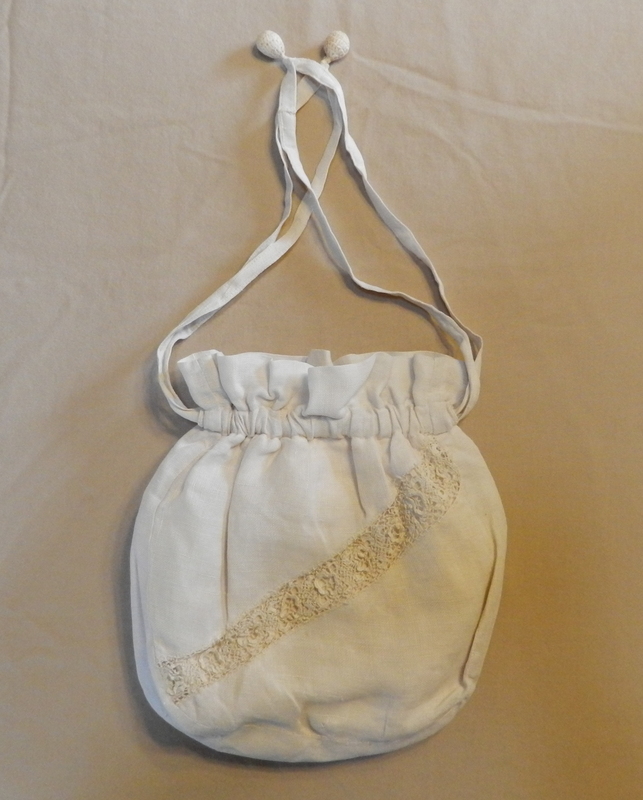 Three: this linen purse from about 1900-1915, which has appeared here before in my reticule project posts. Four: these lacy, frilly, girly split drawers, ca. 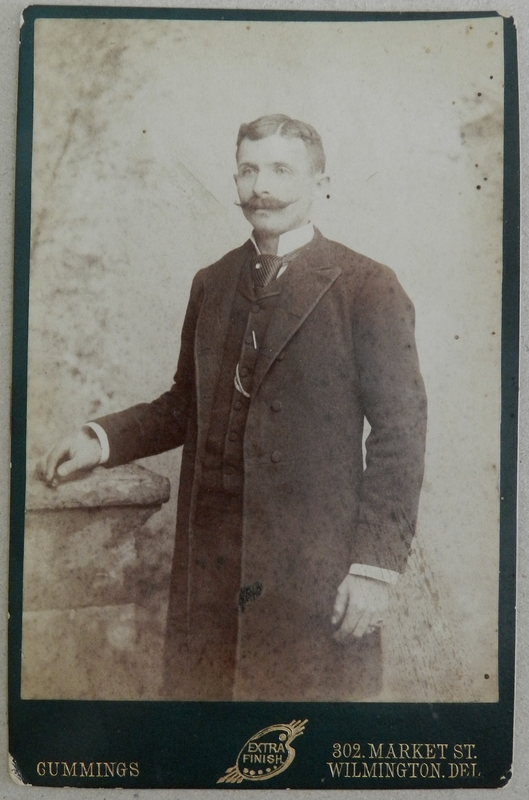 1890s-1900s. Front view, with the fronts crossed more than they would be if it was worn. 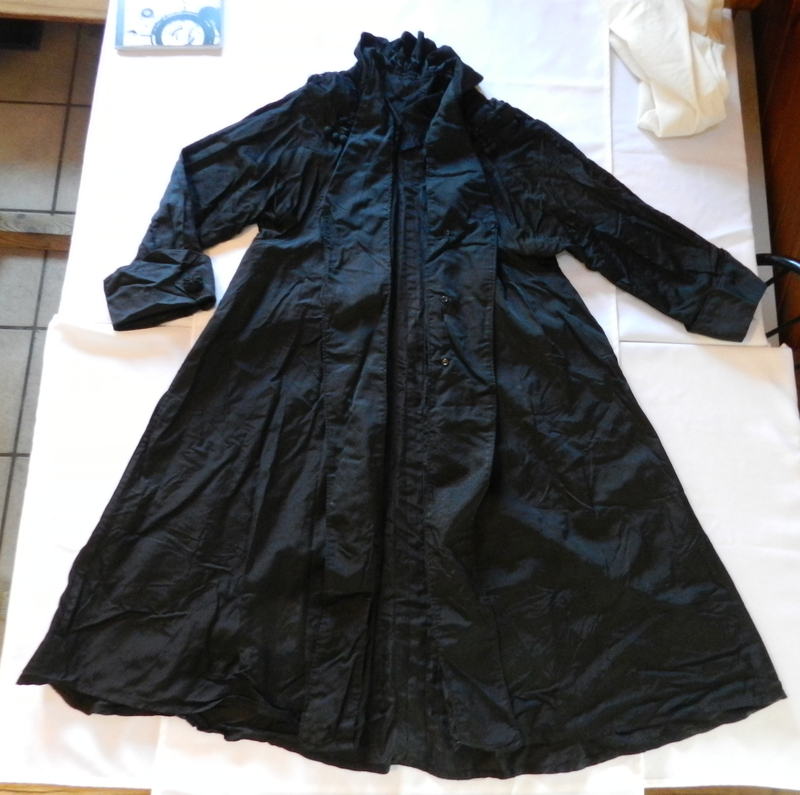 This is my gorgeous silk coat, ca. 1905-1910 (edit: actually 1914-17, after a little more research!). It’s 30% air, 70% held together by luck, and 100% Art Nouveau awesome. So, to keep the awesome going, I’m taking as good care of it as I can, and finishing up a pattern to it. A pattern! The next generation! Because it’s far too delicate to be displayed, and far too awesome to sit in a acid-free box forever. It has to live on! With the fronts folded back. The front buttons are backed with three small 4-hole shirt buttons, to keep the main buttons attachments from pulling the cloth. 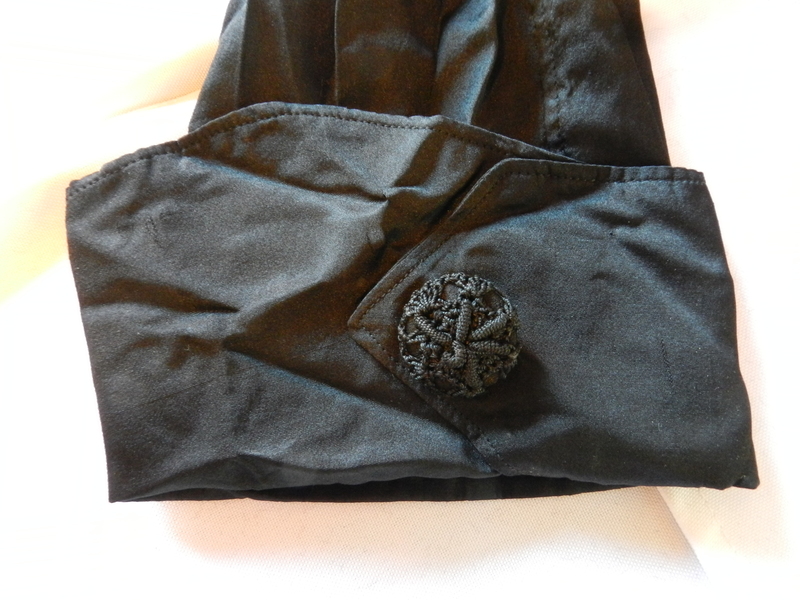 Cuff detail – There are three of these silk macrame buttons down the front, with silk loops instead of button holes. Front and shoulder detail, with a silk cord appliqué at each shoulder. The appliqués have three silk tassels with silk-covered wooden beads at the ends. And, by the way, the true color. Damn digital photography in low light. 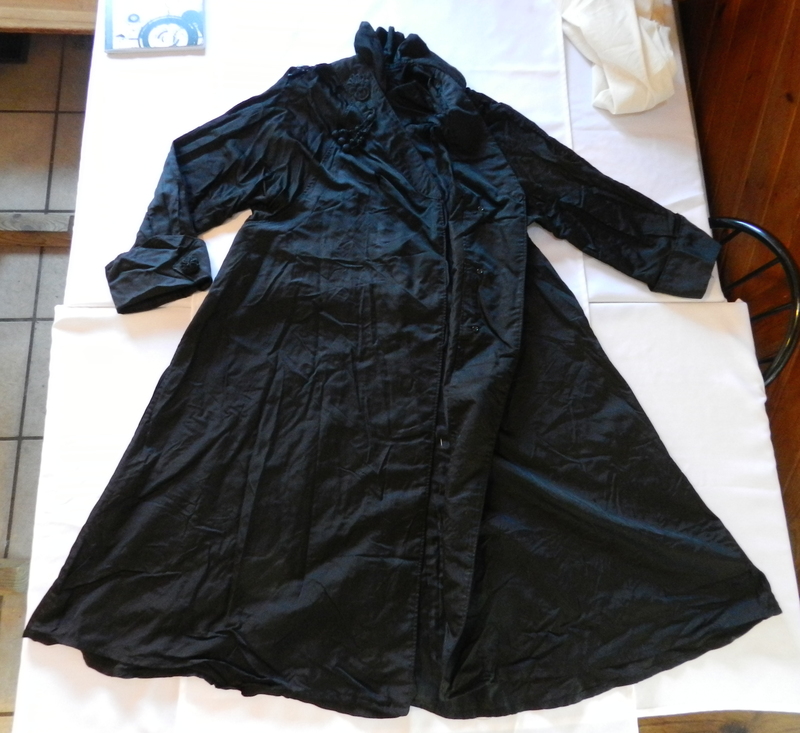 The coolest thing about this coat is that the person I bought it from said it came from a trunk with a tea gown and a bonnet (both of which I have as well, and both of which are fantastic). The bonnet is decidedly older, ca. 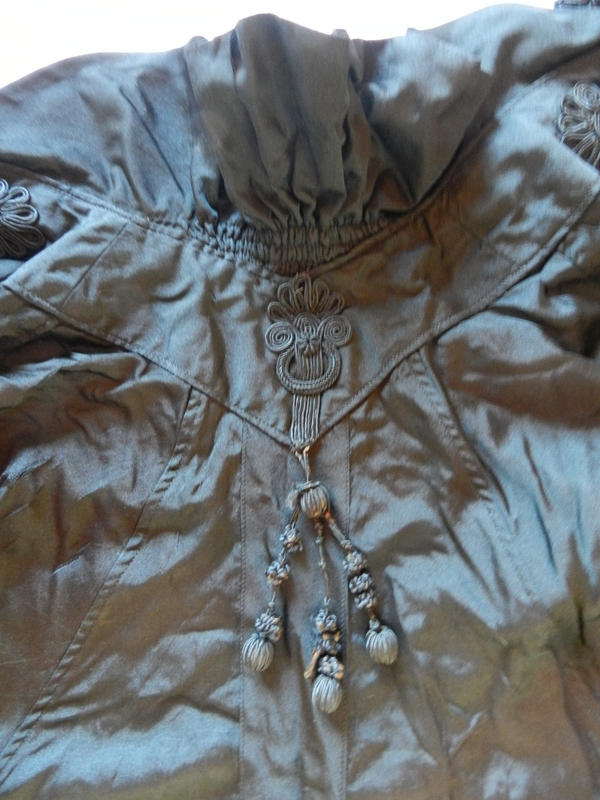 1875-1885, but the tea gown is the same date range as this jacket. I would love to assume they were worn together, and since the jacket is so light (it’s unlined) perhaps they were. They look great together (I put them on my mannequin for a moment last week, before I began to clean and pack them). So here’s the gown, kind of. Beware, these are very poor photos; I took them with my phone. They’re from while the tea gown was drying after I washed it. I’ll get the gown on my mannequin for some real photos later. 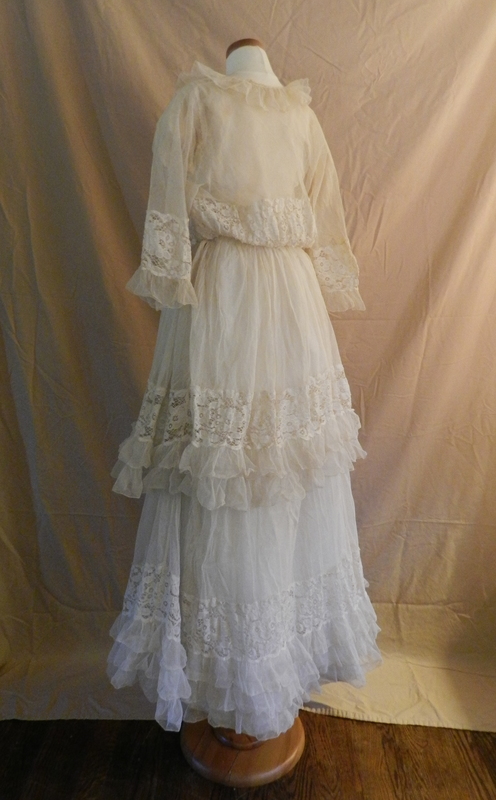 The gown’s completely made of cotton netting and lace. It’s got a net under-bodice and a net under-skirt, but it’s still super transparent. It would have looked so frothy and lacy on somebody, with all the proper under-clothes. The gown itself is in super condition, just a little yellowy. It was musty and yellow-er before I washed it. These photos don’t do it justice. The bodice of the gown, all net and three different types of lace. It has a bloused, wrap front. The two-tiered skirt, all net and lace. To (let it) be or not to (let it) be? I have had a second tea gown hanging in storage for a few months now. It’s a little older than my first, and a little larger, too. It’s also been remade more times than my first one. I think it was made around 1900, remade in the early teens, and then re-remade sometime in the last few decades. I am hoping to get some better pictures this weekend, so stay tuned, I guess. 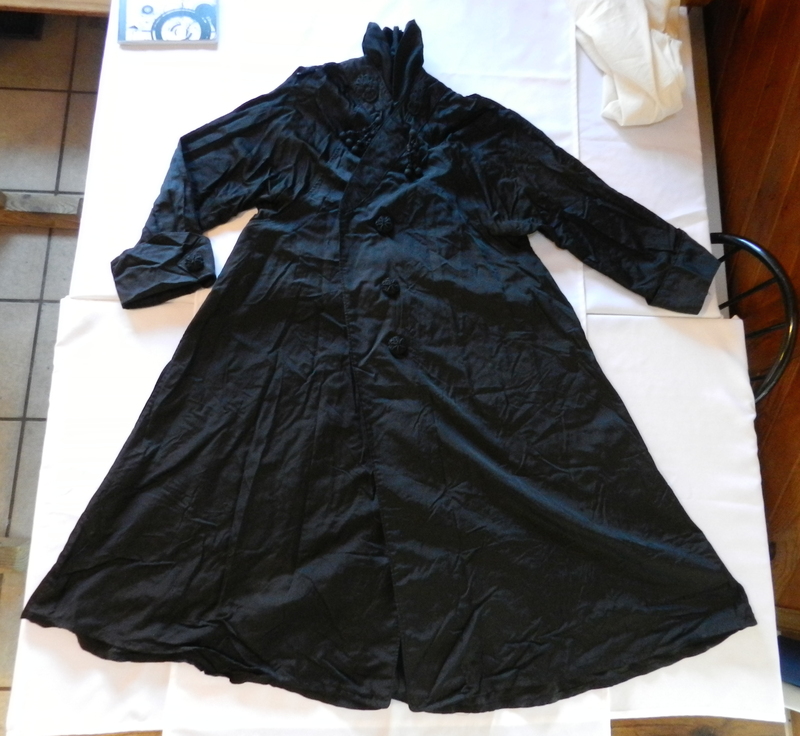 The first incarnation had a longer, flared skirt (I can tell because the seams inside have been re-sewn, and the selvages show the original taper was much wider), and puffier sleeves (the insides of the arms have three ingenious horizontal tucks that persuade the puff to be larger and fuller to the back of the arm). 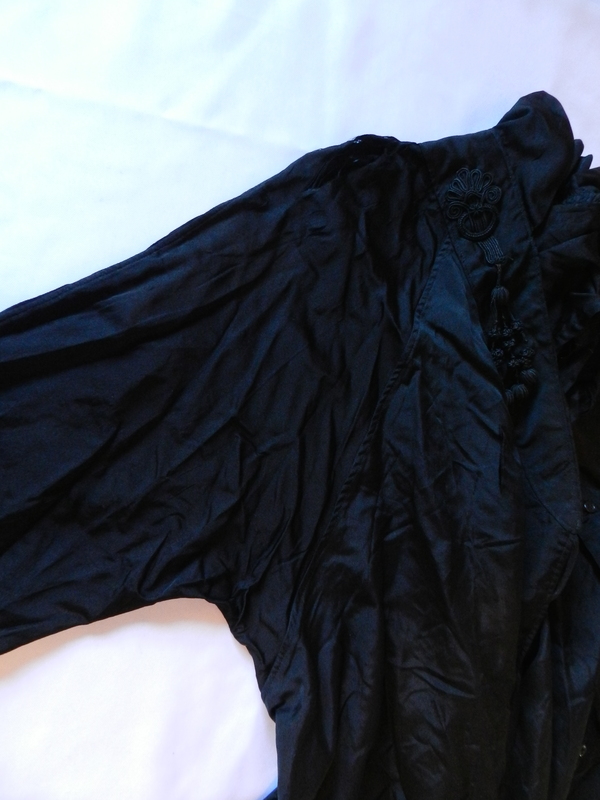 The second incarnation had a narrower skirt, then, and the sleeves were a little longer and less poofy. 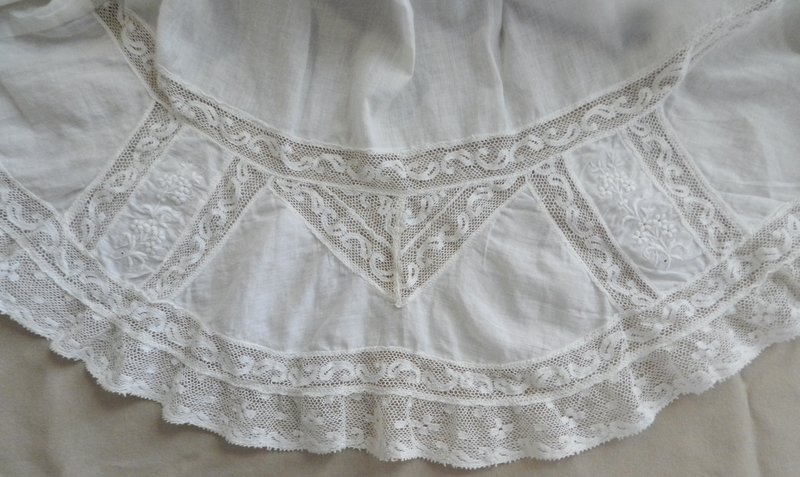 The third incarnation just added snaps down the back and an ugly black ribbon through the lace at the neckline, creating a drawstring. I really do like that this dress has so much to tell. 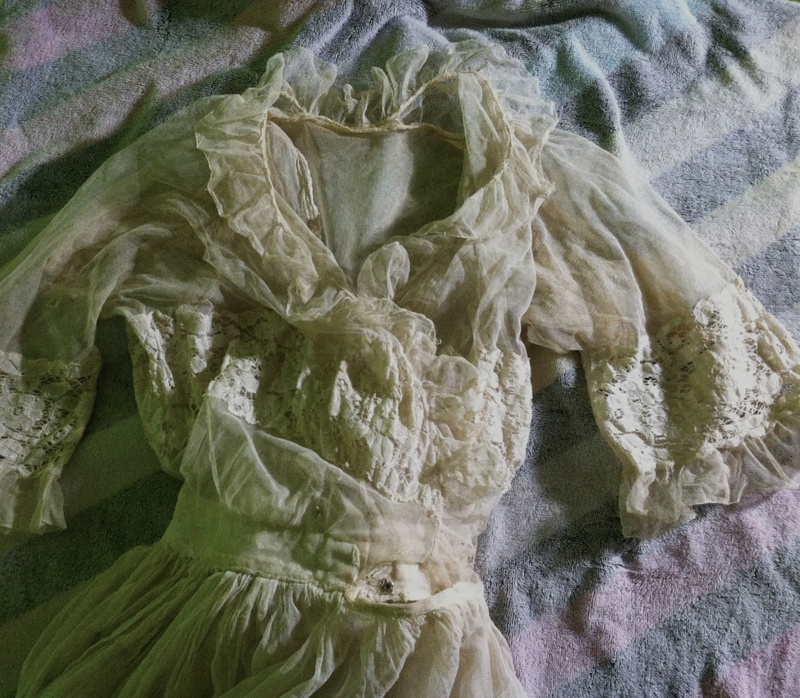 It’s been worn by two or three people in the last 100+ years, each leaving a mark. I would love to retain all that information, but then again, I’d love to repair the dress as well. So to what point do I restore it? Do I even try? I’ve already removed the drawstring and I’m considering taking the snaps out. 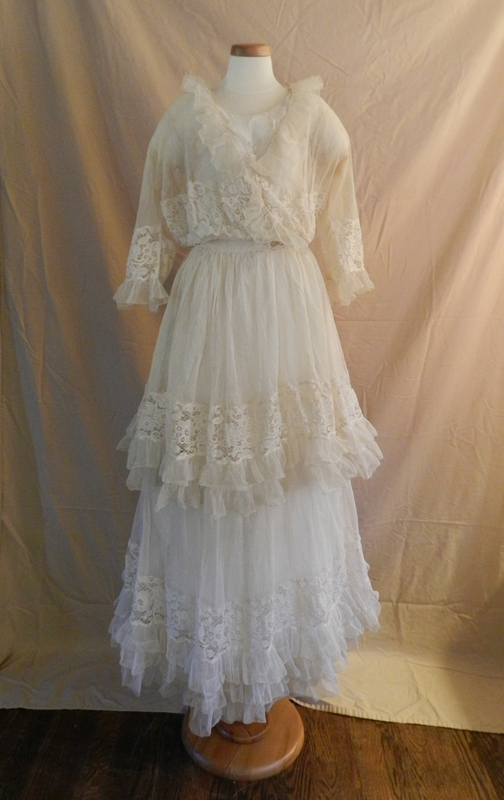 I can’t re-flare and lengthen the skirt, so it’s not going back to 1900. I could put the tucks back in the sleeves, but it won’t be complete without the longer skirt. Without a provenance, all this dress has is the story of alteration after alteration, owner after owner, for a hundred years. I may just wash it, repair the damage at the front (there’s a large tear, but it doesn’t show because it’s inside a pleat) and see how I feel about it.